Location: Castle Park, Bristol in England. Built: First mentioned in 1088. Ownership / Access: Public open space. Notes: Bristol Castle was a Norman castle built for the defence of Bristol. 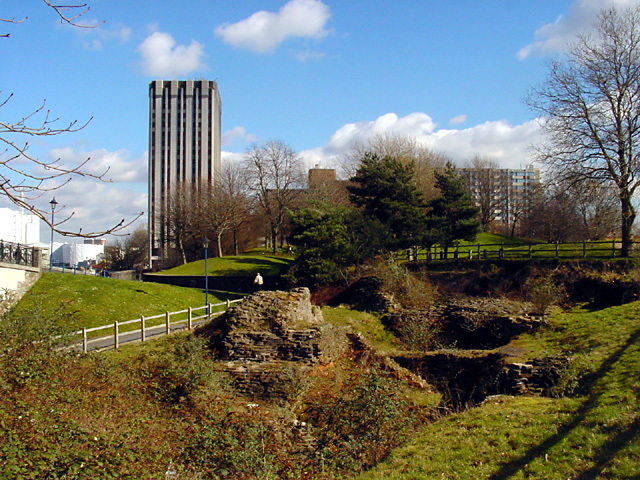 Remains can be seen today in Castle Park near the Broadmead Shopping Centre, including the sally port. The castle was demolished in 1656, according to Millerd's map of Bristol (above right). However one octagonal tower survived until it was torn down in 1927. It was sketched by Samuel Loxton in 1907. There are some remains of the banqueting hall incorporated in a building which still exists above ground today, known as the Castle Vaults. In 1938 the Castle Vaults was used as a tobacconists shop. The castle moat was covered over in 1847 but still exists and is mainly navigable by boat, flowing under Castle Park and into the Floating Harbour. The western section is a dry ditch and a sally port into the moat survives near St Peter's Church. The area was redeveloped for commerce, and later largely destroyed in the 'Bristol Blitz'. It was subsequently redeveloped as a public open space, Castle Park. A 16-metre (52 ft) long postern tunnel runs underneath the south west part of the castle.